Will begin Day 31 of P90x today, but am thinking about Day 29. There are so many good blogs out there on it. One of my favorites is from a real overachiever in the San Francisco Bay area – http://www.fitbomb.com. Check it out. It’s a nicely daily diary of his journey! Sunday, Day 29 was torture in terms of beginning the week 5 rotation after a morning Sprint triathlon. Held indoors at the Northeast Lincoln YMCA in support of the Strong Kids Campaign, the Sprint was a blast. Even more rewarding was doing this alongside my son Joshua. He ripped through the kids dualthon. He finished his 50 yard swim and 3/4 mile way too fast (should have done the 100 yard swim and 1 mile for the 11-13 age group, actually wished he would have swam my 500). The good news he was there to run the lap counter and lament that dad still doesn’t have his flip turn down (I can coach it and did it in high school but need to tune it). A pedestrian 10:30, 500 yard swim (need to get that to 8 minutes soon), fast 10 mile bike (32 mph- love the spin machines) and good 5k on treadmill (23:55) left me pumped. And left me lamenting the new set of punishment and torture in the evening. This was probably my most lack luster workout of them all, yet was glad I still brought it, tried my best and forgot the rest. 1 ARM push-ups, now familiar chair dips and pike push-ups were just what I needed to bring me out of my shell. All 24 exercises were worth it. I’ve been blessed this year to hit mileage highs for the 2000’s: 1,500 running, 475 cycling and 25 swimming miles. I’m nudging personal bests from 5k to 1/2 marathon (running). I’ve been able to extend my fledgling triathlon pursuit to the Olympic distance and had the thrill of completing my first Pike’s Peak Double in August. Trimming my marathon time back into 4 hours and onward 3 hours 30 minutes have proved daunting though. While on track for a good marathon time in October (perfect day and course at the Des Moines Marathon on October 18th) – a sore left Sartorius / Hip Flexor muscle group jumped into the fray. http://sportsmedicine.about.com/od/glossary/g/Sartorius_def.htm. It was a recurrence of a similar, more significant pull from 1996. Revving through a course PR Omaha 1/2 marathon, I felt the left quad/groin area sing a bit – actually scream – coming down a steep hill at mile 9. Finishing the race strong, I thought nothing of it until the next day and ensuing 3 weeks. So hobbling to the Des Moines Marathon start 3 weeks later, thanks to some ice, cold soaks and vitamin “I” (ibuprofen) – I reflected — “it’s time to get serious about the root cause”. My 4 hours 30 minutes was ok and I was grateful to finish – but not nearly what my average 1/2 marathon times of 1:45 and weekly mileage were trending toward (3:50 to 4 hours). You see the root was more of trunk cause – the core / pillar strength, or from right above my knee to below my pecs. Years of running had weakened the quad area and at times gave me a false pass on core/pillar conditioning. My strength training focused on the shoulders, arms, upper chest with occasional grudging crunches or leg lifts. So in essence, I was running on limbs with poor support from the trunk. Swimming had helped improved the trunk, but I was in desperate need of more. Classic mistake. In early June I had the idea that core strength should be high on my list. I had watched enough of the P90x infomercials and thought, “didn’t seem like a magic-exer-waist band, roller, glider gizmo fraud” (the lengthen excerpt below discusses this at length). Plus they looked pretty ripped. Even if I could get 50% of the results, then worth the venture. Sealing the deal was the impact it made in some of my friends lives, who went from sedentary to healthy weight/nutrition over a several month span. So felt God had laid one of those lemonade from lemon moments and placed the perfect opportunity to “get real”. Post Des Moines marathon seemed to be the perfect time start (and stave off those post marathon “blues”). I wanted something I could hit after a morning run with little or no additional equipment. I used to do something similar, or attempt to, at the YMCA before I began running with my most devoted running partner, Heidi – 65lb yellow lab of endless hyper energy. But having her sit, down, wait, stay is not her strength while I hit it for 45 minutes after our run. After my lovely wife captured the obligatory “Day 1 picture mugshot” of me slumping over, pushing the gut out, unshaven, adderall deprived, kids mocking me and looking scary, I began my journey. It does seem, as with any program, that the end picture, in this case Day 90, involves each man getting a man scape: shave/wax to remove chest hair, score a new hair do, bleach those pearly whites, some fake bake, and put on the happy music for the overall ‘vibe’! Women go through their own mysterious “after” routine. But I digress there. Week 1 to 2 were tough! In a nasty, good, fun way. My left sartorius area was still tender and could feel it on the jump training (plyometric), Ab X, Yoga and Back Leg exercise routines. Specific exercises that helped me remember Mr. Sore Sartorius was still there were the “hot foot felonies”, “scissors of stress” and “warrior torture pose”. By the middle of Week 2 I could feel the core and pillar strengthen with validation on a series of speed/ track workouts. 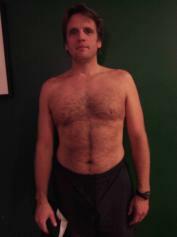 In Week 3 to this Week (4) I’ve noticed a trimming of about 1 inch on waist from my runner’s / sympathy child birth weight gain “pooch” (which when your youngest is 8 years old and you’re a guy, doesn’t buy a whole lot of , scratch that, any sympathy). Do I have six-pack abs yet? No. But I’m getting closer. The “insulation around those six-pack abs to help keep the beverages cold” has been reduced. I think I qualify for a 2 pack. I’m not at the point where those abs can be used as a wash board, but at least I can see where the washboard is at in laundry room closet. Get it? I’m eager to not only finish the 90 days but to keep this as a continual habit. It takes 21 days to form a new habit (good, bad habits seem to in grain after 2 days). I’m there and more importantly am eager to see the proof in the pudding for the 2010 marathon, road race, triathlon other crazy stuff that 45 year olds “shouldn’t do” type schedule. If this helps you – please let me know. If you’ve found another way to strengthen your core and pillar, share that as well. I’ve included additional references below from Active.com. You don’t have to run out and purchase P90x or any Beachbody product. You don’t need to rush to a local health club bootcamp. Though either one is not a bad idea and will help keep you on target! You can follow your own path. I just found that the lack of a video (Tony’s smiling face) or a group (what I have in running with human and dog friends, or spinning, cycling and swimming next to my kids) tends to diminish my enthusiasm and accountability. Core strength is essential for optimum health and athletic performance. You develop some core strength just doing what you do-moving throughout your day, including running. But to optimize core strength you will have to apply yourself to specifically strengthening your abdominal muscles. Your payoff will be better running performance, lower risk of back pain, and last but not least, an aesthetically pleasing midsection. You won’t want to waste your time or money, however, on ineffective exercises or expensive gizmos. In a study from San Diego State University, researchers tested and ranked the leading abdominal exercises and equipment and found some surprises. Effectiveness was evaluated by measuring muscle activity using electromyography. For one, the ubiquitous “crunch” is way down the list (11th out of 13) for effectiveness. But even the poor crunch bettered the Ab Rocker, which (for nearly $70) came in dead last for effectiveness. None of the tested equipment (Torso Track, Ab Roller, or Ab Rocker) targets the abdominal muscles as well as these top-rated exercises: the Bicycle maneuver, Captain’s chair, crunches on an exercise ball, and the reverse crunch (see below for descriptions).